Periapical abscess: located at the apex of an infected tooth surrounding the roots. 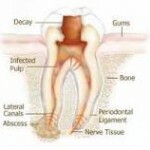 Periodontal abscess: located in the periodontal ligament (PDL) surrounding the tooth. Gingival abscess: located on the gingival surface smooth and shiny involving the marginal and interdental gingiva. When you visit the dentist, he or she will tap your tooth using a dental probe to see the response. He might use an ice stick or hot gutta percha to test for cold and hot sensation. An electric pulp tester (EPT) is used to conduct low electrical conductivity to stimulate the nerve. This is necessary to decide the vitality of the infected tooth. A dead infected pulp tissue may stop the pain but bear in mind that the infection still persists and will continue to spread to the surrounding bone and supporting tissues. They can cause erosion of the bone and soft tissues if not treated. This may result in secondary facial cellulitis or osteomyelitis. Dental abscesses that have extended to the floor of the mouth or to the neck can become life-threatening, blocking the airway and causing difficulty breathing. How to prevent an abscess? Practise good oral hygiene, ensure your teeth is clean by regular brushing and flossing between teeth and gums. Use a fluoridated toothpaste. Rinsing with an antibacterial mouthwash may help cleanse the mouth. Visit your dentist to get regular check-ups and professional treatment like scaling, restoration or root canal treatment every 6months. A root canal treatment – this procedure is done to achieve drainage through the root canal situated inside the pulp chamber. It helps to reduce the infection and remove any diseased root tissue including the nerve and vascular tissue. A crown can be considered after the root canal treatment is over as the tooth structure may be brittle in nature and prone to fracture. It is the most common form of treatment for an abscessed tooth. Extraction of the abscessed tooth to allow drainage through the socket. This maybe required in cases where the decay or crack is extensive and the tooth is unrestorable. 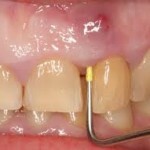 It is necessary to extract when the infection is severe leading to loss of tooth tissue/bone. However, gingival abscess does not cause bone loss. Incision over the swollen gum tissue or draining through the pocket by inserting a probe. Root planing is done where the root surface is cleaned and smoothed. When necessary, surgical procedure such as gingivectomy can be done to eliminate the pocket and prevent recurrent infection. Once an abscess is drained, the pressure is released and this often provides a great relief of the symptoms. Dentist will usually prescribe some medication to help such as antibiotics to fight the infection. This can be taken prior to treatment planes escpecially in cases where the swelling is extensive and pain is unbearable. Warm salt-water rinse can help cleanse the mouth, encourage drainage and relieve some amount of pain. This can be done several times daily and is commonly recommended for gum abscess. An antibiotic’s action helps but does not clear the pus accumulation or eliminate the infection until the pus is drained. The course of antibiotics can thus be continued even after achieving drainage. Ibuprofen and other over-the-counter painkillers can be taken to relieve the pain.